Blade Symphony is an indie game made by Puny Human Games. It was successfully greenlit on Steam's Greenlight service and managed to release on Steam's Early Access platform. As soon as the game launched on Early Access I grabbed up a copy. It's sort of become a habit to buy games that I instantly feel will help support the developer in some way; Blade Symphony was one of those games. I wasn't really familiar with Blade Symphony before last night – despite seeing the game frequently in the Greenlight section, I never had time to do a write-up for the game. Well, after spending many months sitting in my library, I took the opportunity to install and boot-up this ambitious sword-fighting game. As we all know, the PC platform could definitely use some more fighting games (especially with Clang going bust) and any game that offers multiple sword fighting styles, techniques and customization is definitely a good thing in my book. So after booting up the game for the first time, I instantly scoped out the customization – because I honestly had no idea what the game was really like. I fell in love with what I saw. While the game only sports four playable characters with minor customization for the head, body skin and cape, it was the weapon selection that absolutely floored me. 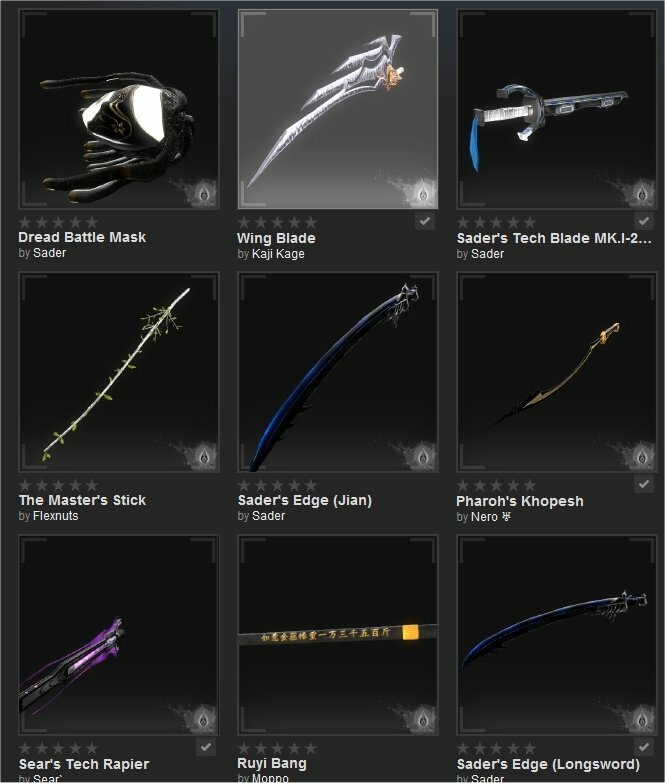 While all the standard in-game weapons required unlocking and ranged from katanas and rapiers to jians and broaswords, it was the Steam Workshop content that had my mouth watering. The Dragonslayer from Berserk was one of the first weapons I downloaded, along with Cloud's Bustersword. I grabbed a bunch of other custom-made swords and let my eyes lust over their awesomeness for a time. However, looking without touching is less than half the battle. It was time to put these swords to the flesh of an opponent and see how well they handled. Since I had no idea how to play the game I actually bothered to play through the tutorial from start to finish. There are a lot of small nuances to the play mechanics of Blade Symphony that require good memorization and key timing. 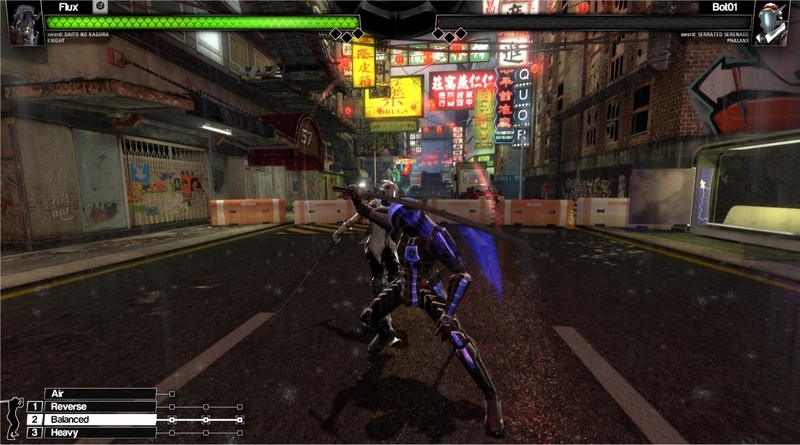 Using an Xbox 360 controller, all attacks are done with the right-trigger and blocking is handled with the left-trigger. Using the direction of the left-analog during attacks will change the direction of the attack. There's a swing arc that glows slightly in front of your character so you have an idea of where your next attack might go. There's a side-step button, a roll and a jump button. 'X', 'Y' and 'B' change the fighting stance – just like Bushido Blade – from fast to balanced to heavy. Now the really cool part about the way the buttons are setup, you can start a string of attacks from, say the fast stance, and then quickly switch to the heavy stance to finish the attack. It requires a lot of precision button/analog/aiming skill to execute complex combos and counters. Using the direction of the analog also allows you to perform parry attacks and cancels. So you can start an attack string and then cancel into a riposte. 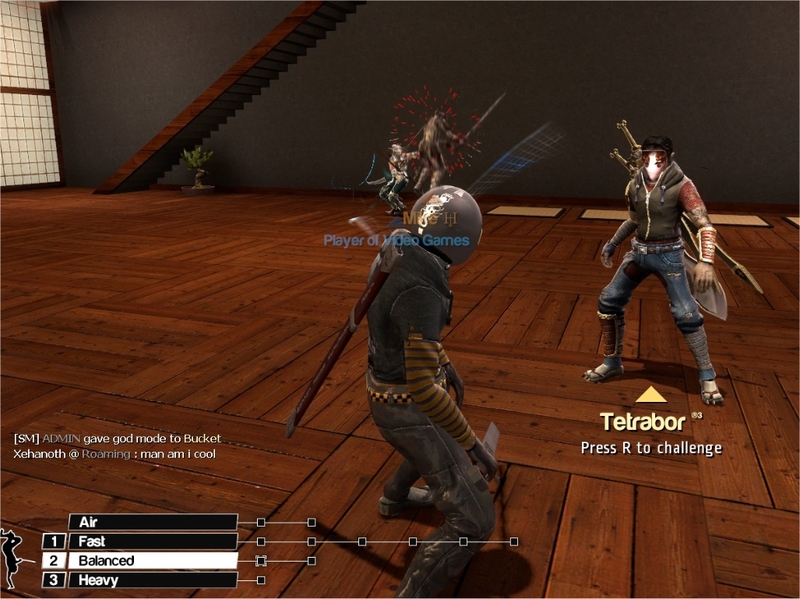 Speaking of fencing tactics – there is literally the ability to fence. It's a rare feature in many sword fighting games and rarely ever done right, but it's a very interesting fighting style in Blade Symphony. My only gripe is that the fighting styles are attached to each of the four characters, instead of being attached the weapons. But maybe that will change later on. As for the game itself... after finishing the tutorial you can only play in online game sessions against other players. There's no arcade mode or anything of the sort. Even still, the online mode is where you earn points to unlock new gear for the characters, as well as new weapons. I ended up in a lobby with just over a handful of other players, and you can either free-brawl with other players and die and respawn (it doesn't add or take anything away, it's just a free-brawl) or you can partake in a one-on-one private duel. Now, the game was obviously designed to pay some kind of homage to the Bushido Blade style of fighting games. It's easy to get wins with just a few hits or properly placed counters. However, the game is still in Early Access and it feels like it's still in Early Access. Some of the animations still need to be cleaned up and some of the transitions aren't quite as smooth as they could be. Also, blocking isn't always as responsive as it could be. In result, I found myself using the roll and side-step more frequently given how unreliable the blocking turned out to be. I'm not sure if I was just doing it wrong or whatnot, but it was just slightly less responsive than what I felt it could have been. As for the fights themselves... they can be very dynamic and cinematic if you know what you're doing. I didn't really know what I was doing, and eventually retreated back to the tutorial to practice on the AI a bit more and find a fighting style and sword that better suited my tastes. It's a game that will definitely require a lot more play-time before any final judgments about the system or mechanics can be made, but right now it looks like it's aiming to be the spiritual successor to Square's Bushido Blade series... but it's not quite there, not yet. A bit more refinement in the animation department and slightly tighter controls, and Blade Symphony could be a modern-day classic in the making. You can learn more about Blade Symphony by paying a visit to the official Steam page.